Wallace Stegner's uniquely American classic centers on Lyman Ward, a noted historian who relates a fictionalized biography of his pioneer grandparents at a time when he has become estranged from his own family. Through a combination of research, memory, and exaggeration, Ward voices ideas concerning the relationship between history and the present, art and life, parents and children, husbands and wives. Like other great quests in literature, Lyman Ward's investigation leads him deep into the dark shadows of his own life. The result is a deeply moving novel that, through the prism of one family, illuminates the American present against the fascinating background of its past. 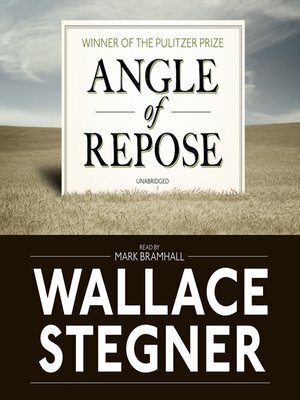 Set in many parts of the West, Angle of Repose is a story of discovery—personal, historical, and geographical—that endures as Wallace Stegner's masterwork: an illumination of yesterday's reality that speaks to today's. Wallace Stegner (1909-1993) wrote many books of fiction and nonfiction, including Crossing to Safety and the National Book Award-winning The Spectator Bird. Angle of Repose won the Pulitzer Prize in 1972.